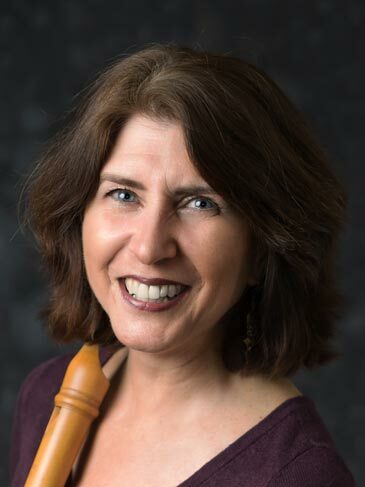 Vicki Boeckman is a well-known pillar of the recorder community in Seattle and in demand as a teacher pretty much all over the United States, teaching at workshops across the country and in British Columbia. She is a passionate performer of all styles of music and her career has been a highly rewarding journey performing with wonderful musicians throughout Denmark, Sweden, Norway, Germany, Austria, Italy, England, Scotland and British Columbia. She has recorded about 15 Cds with various ensembles and loves playing a wide variety of musical styles. Vicki resided in Denmark from 1981-2004. While in Europe she collaborated with some of the finest musicians of the day such as Jaap ter Linden, John Holloway, René Jacobs, Lars Ulrik Mortensen, Pedro Memelsdorf and Markus Zahnhausen. She was an adjunct professor at the Royal Danish Academy of Music in Copenhagen for 12 years, and taught at the Ishøj Municipal School of Music for 23 years. A recorder youth orchestra founded by Vicki and her Danish colleague Dorte Lester still continues to flourish. Since settling in Seattle in 2004, Vicki has been a featured soloist with the Portland Baroque Orchestra, Portland Opera, Philharmonia Northwest Orchestra and the Skagit Symphony. She was a returning guest with choral ensemble Magnificat in the Bay Area from 2008 - 2016, and performs with Seattle Baroque Orchestra, Pacific Music Works, Medieval Women’s Choir and Gallery Concerts. Her Seattle-based chamber trio, Ensemble Electra, with violinist Tekla Cunningham and harpsichordist Jillon Stoppels Dupree, specialize in music of the 17th and 18th centuries. Her duo with recorder maker David Ohannesian is a popular addition to the Early Music Guild’s School Programs, and is often asked to return to the same schools year after year. Vicki is a two-time recipient of the Recorder residency at the Sitka Center for Art and Ecology in Oregon, and a two-time recipient of the Jack Straw Artist Support Program. Vicki was director for the Portland Recorder Society from 2006-2015 and is currently the music director for the Seattle Recorder Society and, with colleague Charles Coldwell, co-director for the Recorder Orchestra of Puget Sound (ROPS) Vicki adores teaching children as well as adults. She has been on the faculty of the Music Center of the Northwest in Seattle since 2005 as well as having a thriving teaching studio in her home. Vicki has been the Artistic Director for the Port Townsend Early Music Workshop since 2011. She loves getting to know each and every one of the participants and welcomes the organizational challenges that directing workshops require. She can’t imagine ever doing it without Jo, however! "Vicki exudes a warmth and openness that people immediately respond to. Demanding in her standards for the quality of music but never impatient or critical of people's limitations. She understands what makes music important, fun, and accessible to all." The organization was splendid. Vicki and Jo did a wonderful job – warm, welcoming and helpful. We were informed from early on and always had our questions answered promptly. Special thanks to Vicki and Jo for all their organizing: Vicki for her relaxed, vivacious hospitality and Jo for her quiet, ever-pleasant efficiency. The workshop was terrific. Thanks Vicki and Jo for a well- run, organized and fun workshop! Jo you are so calm and helpful. Vicki you do a great job being an emcee and are so welcoming to everyone as you mingle.